By volunteering with cats Protection you really can help make a difference to the lives of cats, kittens and people in your community and across the UK. Thank you for your interest in volunteering with Birmingham Adoption Centre. With up to 200 cats in our care at any one time we could not achieve what we do without the hard work and dedication of our volunteers and donating your time is a great way to support us and have fun at the same time. 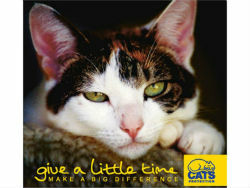 Your time is hugely important to us and we take volunteer roles very seriously. Each and every volunteer is a hugely valued member of our team, and we offer training, advice, support and guidance and strive to make volunteer roles as enjoyable as possible. As a volunteer we aim to ensure you feel you are directly contributing to the care of the cats, as well as having the opportunity to learn new skills, meet new people and form new friendships. Given the nature of what we do on any given day, we do need to have an organised and structured approach to our week so ideally we need volunteers who feel able to regularly commit to a set time/day each week. Please see below for current volunteering opportunities within the centre. If no roles are listed then we are currently not recruiting for volunteers. *Please note, due to resources we are currently unable to take on school work experience placements.